I finished a commissioned portrait not too long ago, as a gift from a mom to her daughter (for Mother’s Day) of her baby son. I was not a friend of this woman on Facebook, so I never got to see all the rave reviews that other people were seeing and sharing. But, she was very happy I heard and so this makes me happy. I couldn’t believe it when I first saw his photograph, the expression on his face was priceless and I couldn’t wait to try painting him. It was a lot of fun. So here he is, Mr. Mason! So cute! I just recently painted this pastel painting of two adorable, little boys that are grandsons to an ex-coworker of my husband, John. He lives in South Carolina, and so I mailed it to him and his wife. It was kind of a surprise. These are the two reference photos I used for the painting. The little boy with the glasses is older now, so I had to change a few things to make him look older than this reference photo. It was a joy to do both of them and even happier that they loved it. Makes me happy! I don’t know what it is, but whenever I do a portrait I somehow feel connected to the subject somehow. I guess when you spend a week or so going over the eyes several times to just get them right, or smoothing out the cheeks, adding color here and there, wrinkles and subtle touches that define the person, it’s hard not to feel a connection. 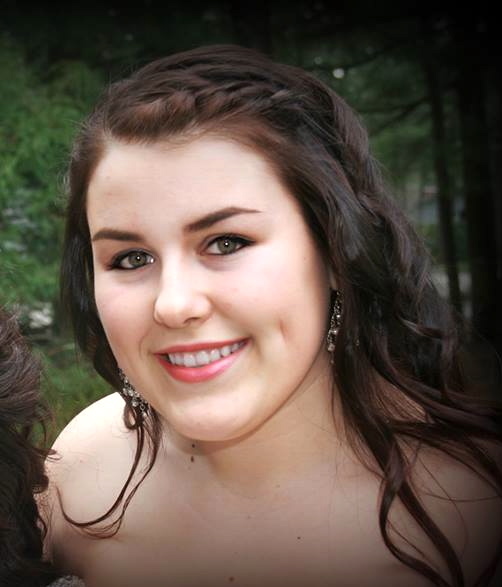 You are not only painting a picture but expressing an emotion with the sparkle in the eyes and the curve of the smile. You want it to feel like the subjects are there in the room with you, and if they passed on, they feel somewhat alive again. I guess that’s the best way I can explain it. That’s what I try to achieve in my portraits. 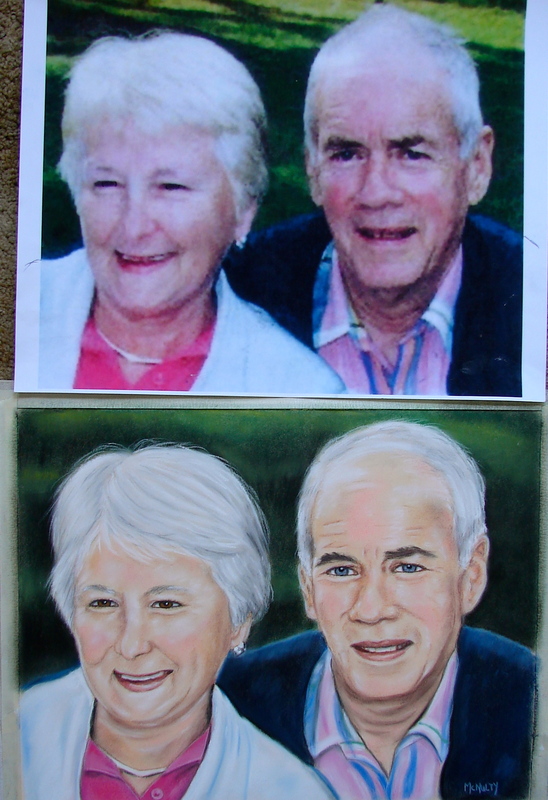 The commissioned portrait came from a woman who wanted to give it to her father as a gift, It was of his parents. 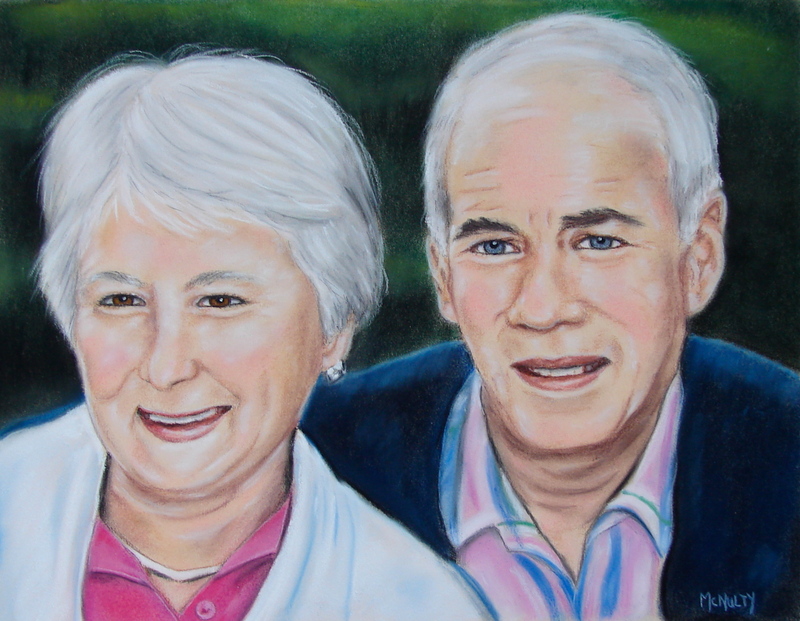 This portrait was really special to me because first, it was my first couple portrait. And second, I found out they both passed away on the same day. All I kept thinking was how they must have loved each other so much, they could not even leave each other. So, it was even more important for me to get this right. The only thing was, I only had a small picture to do the portrait from, and even when I blew it up to get the details, most of the fine details were missing, like the woman’s eyes. I could not see the colors of either of them as well. I had to ask what the colors were and hope for the best. 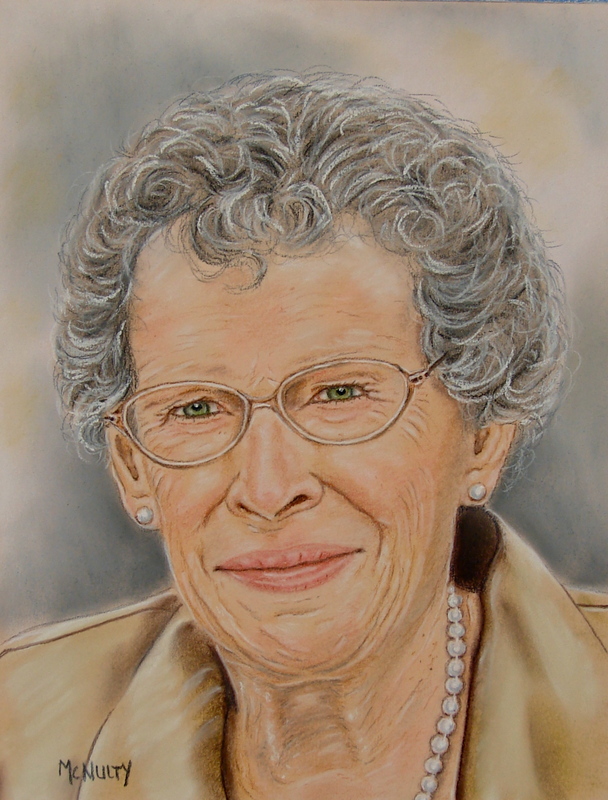 This is a pastel portrait I recently did for a brother-in-law of his mother who is about 87 now. It was mentioned to me that they were thinking of having a portrait done and then it was never mentioned again. So I set out to find a good photo from another sister (so it would be a surprise). The best photo from all the photos that she gave me was this one you see here from a wedding. In the picture you can’t tell, but she has macular degeneration of her eyes and she can barely see. The color of her eyes were hard to make out from the photo I was given only because her eyes now show up dark or even black in a photo. The first thing I had to do was find out her original eye color so I could paint her eyes first. I googled her original eye color and then painted them from the photo reference. It made all the difference. After that, I filled in her hair a little and closed her lips, as this always makes a nicer portrait. I like it to feel as if the person I am painting from a photo, looks like they were sitting right in front of me. This is how I feel the portrait came out. She looks about 10 years younger with a beautiful, coy (somewhat mischievous) smile. This is SO her personality. After making the slight changes to her portrait from the photo, I believe the portrait of Bertha is beautiful and will be enjoyed and hope to be a lasting tribute for years to come. 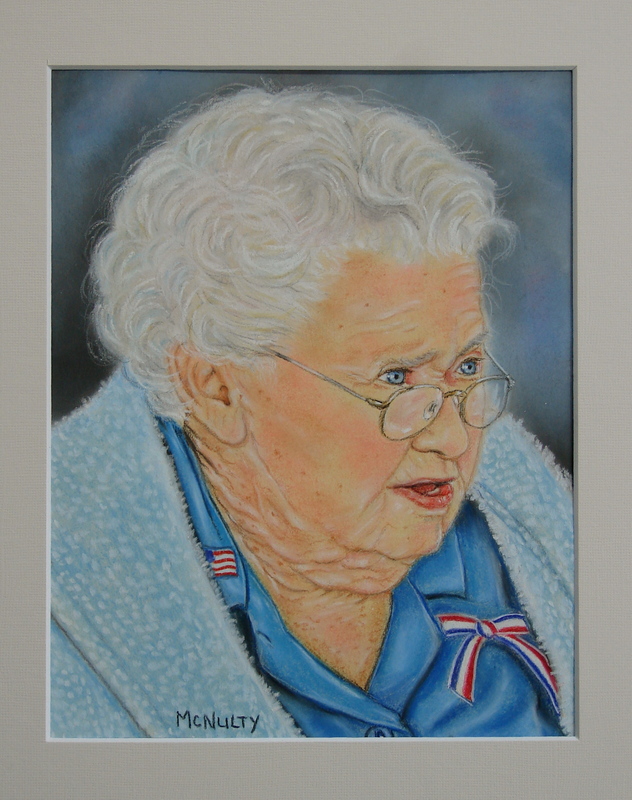 Painted this pastel portrait of Mary McManus (98 years young) for her long-time friend and care-giver Patsy Henry. They are both very close friends of the McNulty family. 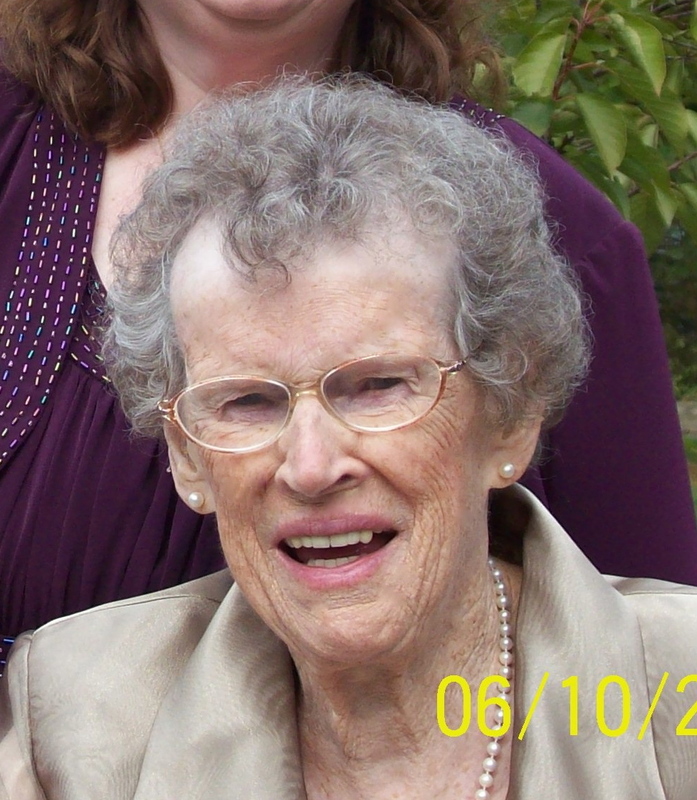 ( Historical tidbit-Mary had worked in her younger days at the Rumford Baking Powder Plant here in RI and still lives in the home with Patsy in the same house she was born in near the local fire station). You can tell how much Patsy loves Mary in just the way she talks about her and how she interacts with her. Patsy does so much to make Mary comfortable and happy, and to watch them together is just so inspiring. When I gave this to Patsy and had her open it up…it was the best feeling ever. She just put her hands to her chest and her eyes welled up and she gave me a hug. That’s all I needed. 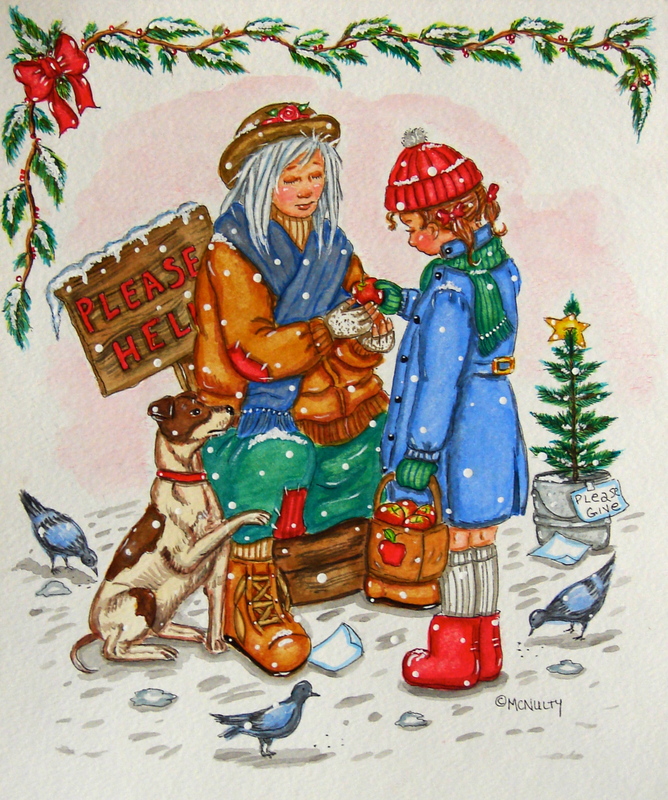 Then she brought over the picture to Mary, who was sitting by the window watching the traffic go by. She asked her who the painting was of. You could see her looking closely up and down and then she smiled and said “Me?” Patsy said, “Yes, it is”, and Mary said , “That’s beautiful”, and kept looking at it smiling. Too cute! My daughter, Kelsey was with me and we stayed and talked awhile and that’s when I noticed a firetruck go by. The firemen were staring at the house as they went by. They look for Mary because if they see her outside sitting on the deck, they honk their horns at her and she’ll wave. It was a wonderful visit and I even had roses to take home with me. Perfect. 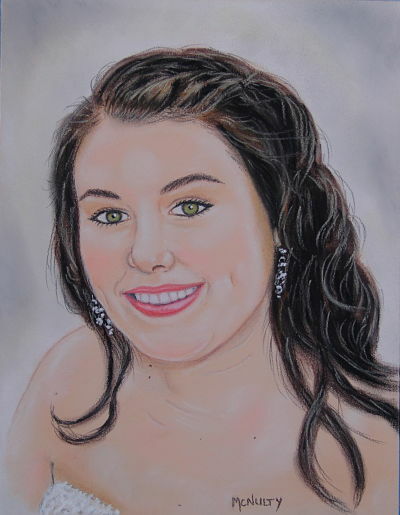 This is a pastel portrait of my niece, Ashley. She just graduated from high school and I gave it to her for a graduation gift. I loved seeing her get so excited after she received it. Onto the next one….